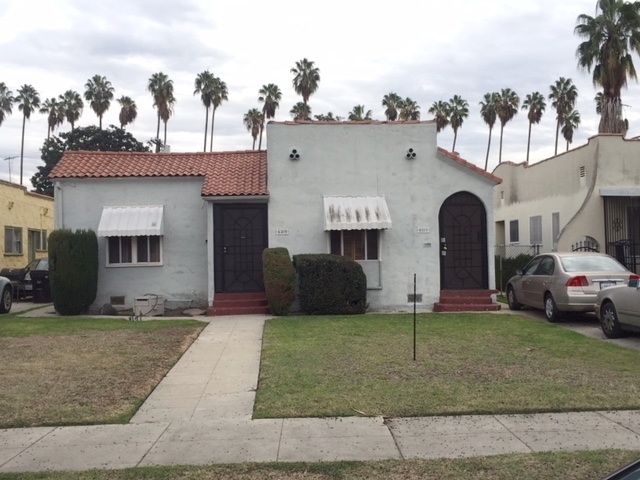 DESCRIPTION: GREAT OPPORTUNITY TO BUY A DUPLEX (2) 1 BEDROOM, 1 BATH UNITS IN LOS ANGELES. BOTH UNITS FEATURE A LIVING ROOM WITH DINING AREA, KITCHEN AND SERVICE PORCH. 2 CAR DETACHED GARAGE . SEPARATE GAS & ELECTRIC METERS. GREAT CENTRAL LOCATION. PERSONAL PROPERTY NOT INCLUDED IN THE SALE. NO COURT CONFIRMATION. OWNER PASSED AWAY IN 4510 10TH AVENUE. 4508 10TH AVENUE – $825 PER MONTH. MONTH TO MONTH. NO LEASE.